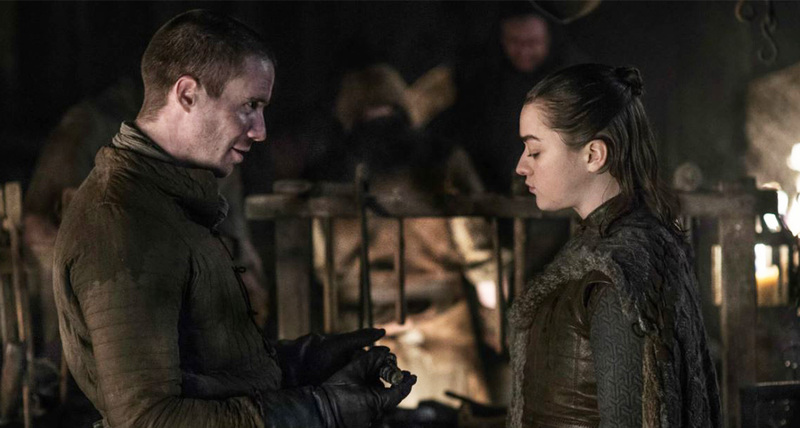 The final season of Game of Thrones airs Sunday, April 14; after seasons apart, it is likely that Sansa Stark and Tyrion Lannister, who had an arranged marriage back in season 3, will meet once again in season 8. When season 7 left off, Sansa Stark, played by Sophie Turner, was Lady of Winterfell in her family home with her siblings Arya and Bran. Further south, Tyrion, played by Peter Dinklage, was on a boat heading north to Winterfell with Jon Snow and Daenerys Targaryen. In season 1, King Robert Baratheon pressured Ned Stark into a marriage arrangement between their children, Sansa and Joffrey. Even as Joffrey began to show his dangerous, evil ways, Sansa stayed enamored with him and the prospect of becoming queen one day. After Joffrey ordered Ned’s beheading at the end of season 1, Sansa remained betrothed to him until Loras Tyrell asked Joffrey to marry his sister Margaery in the season 2 finale; Joffrey set Sansa aside at his mother’s suggestion, using the Stark family’s alleged treason as justification. Although Sansa was no longer tied to Joffrey as his future wife, she remained trapped under the influence of the Lannisters in King’s Landing. When news of Olenna Tyrell’s plan to marry Sansa to her grandson Loras spread to Tywin Lannister, he arranged for Loras to be married to Cersei and Sansa to be married to Tyrion. At their wedding (season 3 episode 8), Joffrey walked Sansa down the aisle to Tyrion, in place of the father he had executed. At the altar, he removed the step stool set so that Tyrion could more easily cloak his bride and laughed throughout the uncomfortable ceremony. ← Is Nene Leakes Quitting ‘Real Housewives of Altanta’? Did She Leave RHOA?